Here I’m going to show you how to create and control complex interactions between RealFlow’s different solvers and material types. Furthermore you will learn fundamental things about “Collider” and “Volume” tags, simulation settings, and the workflow for → rigid/elastic deformer. We have been able to organise a webinar that was originally run a month ago but at times that made it impossible to participate – so we are happy to announce a new dat form a repeat with the same presenter online at a time that is easier for local Australian and New Zealand attendees. In the past, advanced fluids simulations were reserved for large film productions because of their immense cost, high-end software requirements and massive render times. There are in fact numerous uses for these types of simulations: they are, for example, an integral part of advanced motion design and professional product visualizations. Even though the tools required to create these simulations have become notably more affordable and the advances in processor architecture even make it possible for freelancers and smaller studios to meet the requirements for rendering these simulations, the belief is still prevalent that convincing fluids simulations can only be created by experts with a corresponding scientific background. In this basic skills webinar, Danish 3D designer and Cinema 4D lead instructor Thomas Andreasen shows that this belief is no more than a myth. Thomas, who himself only recently started creating his own fluids simulations, shows that Cinema 4D and Next Limit RealFlow have clearly lowered the bar significantly. Thomas uses a perfume advert as an example for demonstrating how to quickly create visually stunning results. This webinar lasts about one hour and you can send questions during the session via chat. To allow more time for the webinar content, we will collect your questions and answer them comprehensively with the help of product specialists from Next Limit. We will make the answers available for all attendees as a downloadable FAQ document! 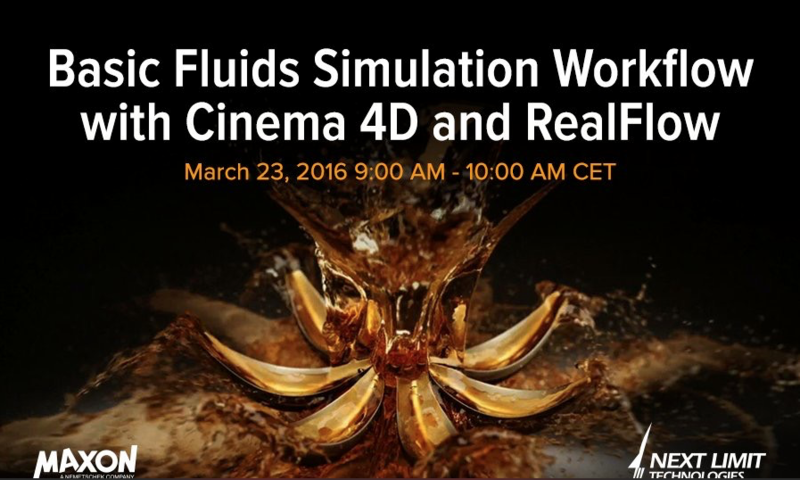 Recently there was hosted a webinar on using Fluid simulation, Basic Fluids Simulation Workflow with Cinema 4D and RealFlow. It was hosted at a European time that made it very difficult for us in the East to view so we are hoping to announce a local timed version fairly soon. But as promised, we recorded this webinar and have made it available online so you can view it at your leisure. If you were not able to experience the live stream you can still see how easy it is to create impressive, realistic-looking fluids simulations. You can also download the Cinema 4D, RealFlow and After Effects setups so you can recreate each step if the simulation on your own computer. A short set of instructions is also included. The related Project files are also available here. Interactive 3D is becoming the new norm with Cinema4D Stereoscopic Rendering and realtime VR – capabilities offered by ‘Unreal Engine’ and other games engines are producing fantastic realism from 3D software like Cinema4D Studio R17 that supports this Stereoscopic Rendering and interfaces to Unreal engine easily. we are finding new ways to enhance and the architectural design experience. Cinema4D has an easy path from ArchiCAD and other 3D design packages including Sketchup to build exciting realistic and interactive displays using Facebook’s Occulus Rift and the new Microsoft Hololens soon to be released that provide this immersive new display experience. Check here for some more background from the Cinema4D Apprentice on how you can use Cinema4D for 3D stereoscopic production . Watch this following video and learn. ( Oct 2015 ) Maxon recently had a webinar on Cinema 4D Architectural Visualization. We have uploaded a recording of this event to our YouTube Channel if you’re interested in solidifying your skills or learning more about its capabilities. For those were not able to attend, we invite you to watch the videos at your leisure to for more on the various Cinema 4D benefits and what it has to offer for architectural visualization. This is a comprehensive review and demonstration of the architectural features that are available in Cinema4D Studio, specifically Cinema4D R17. It reviews the new Sketchup import improvements and also the powerful Mograph capabilities for adding mass 3rd party items such as environmental aspects including trees and plants that add realism to your model. Remember that ArchiCAD and Vectorworks users have a particularly easy import path from these modelling systems. You can download a Cinema 4D scene file with the grass material Johan-Bernd Zweverink used during the webinar here. For those that need more details on acquiring Cinema4D see here for more details. Daniel Lloyd 3D modeller is an up and coming 3D modeller, one of our happy clients and a resident in Auckland New Zealand. Daniel uses our 3D tools; bonzai3D and Cinema4D Studio R15 and he is glad he went down the Cinema4d path, it was a real life saver on the ‘Spartacus Production’ for VFX and the requests from the DOP in being able to take sketchup models via bonzai3D from the set designers and extend the environment virtually, slap in some quick textures, light the scene and hit render.